When you consider it, your wedding reception is one of the biggest highlights of your wedding day. Preparing a good timeline will ensure you and your family, friends and guests get the best possible experience for night to remember! 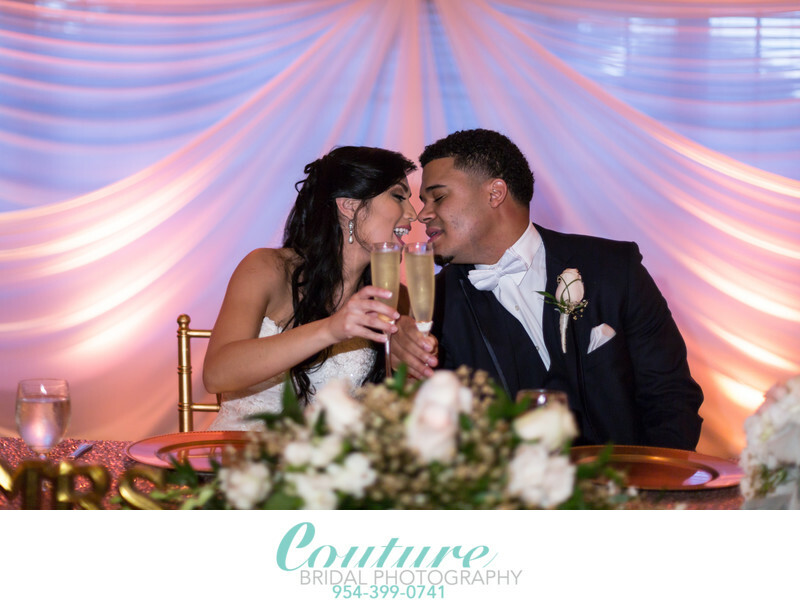 As South Florida’s top wedding photography studio, we want our brides and grooms to have the most memorable wedding day from the getting ready portion of the day to the last dance of your wedding reception. 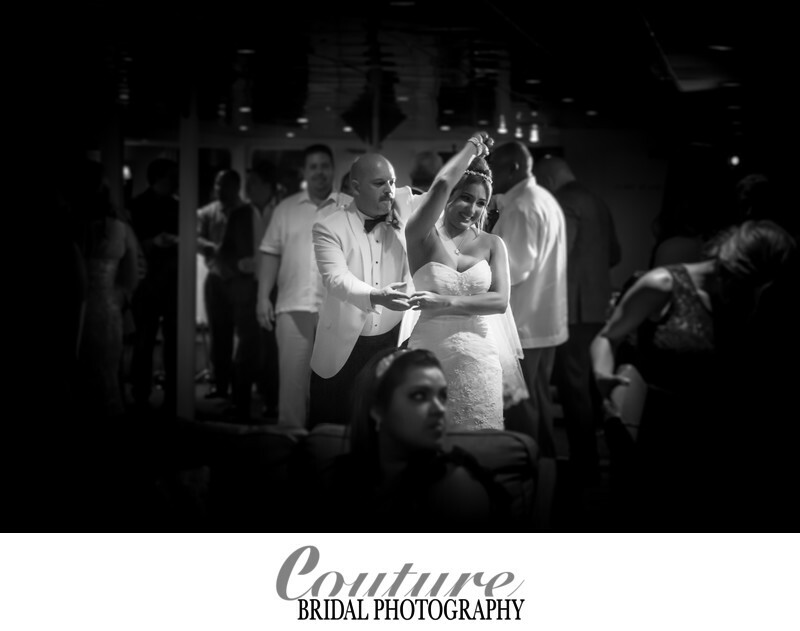 Not only is your wedding reception the part of your wedding day, where you get to let your hair down and party. It’s also an opportunity for us to capture some of the most memorable and intimate moments of your wedding day! Here is a sample wedding reception timeline we recommend and some other really helpful tips to get the party started for a spectacular night to remember. While your guests are mingling after the completion of your wedding ceremony, this is the best time to do your couples photography session and formal wedding family photos. Although you (bride and groom) typically won’t attend the cocktail hour it’s still a great time for your guests to relax, mingle and enjoy some hors d’oeuvres and drinks before they go into the reception. Check out this Wedding Photography Timeline for suggestions on how much time should be allotted for the cocktail hour based on how many formal photos you want done. Your wedding planner and/or DJ/MC will get all of your guests organized and seated in the reception space, so that they are ready for the party to start. If necessary, they will direct guests on how to find their seat and provide any special announcements during this time. When to start getting guests into the reception and estimate of how long this will take are based on how many guests are attending. This is an important part of your wedding reception timeline. Your DJ/MC will announce your family and wedding party entrances at this time. This is a fun and exciting time for your wedding party and/or immediate family members when they enter the reception hall with a fun dancing, being goofy or action that gets your wedding guests excited and ready for your grand entrance. This is your moment to celebrate being introduced as the newlyweds for the first time. Choose your favorite party song, strut your stuff and have a blast! This is your moment! 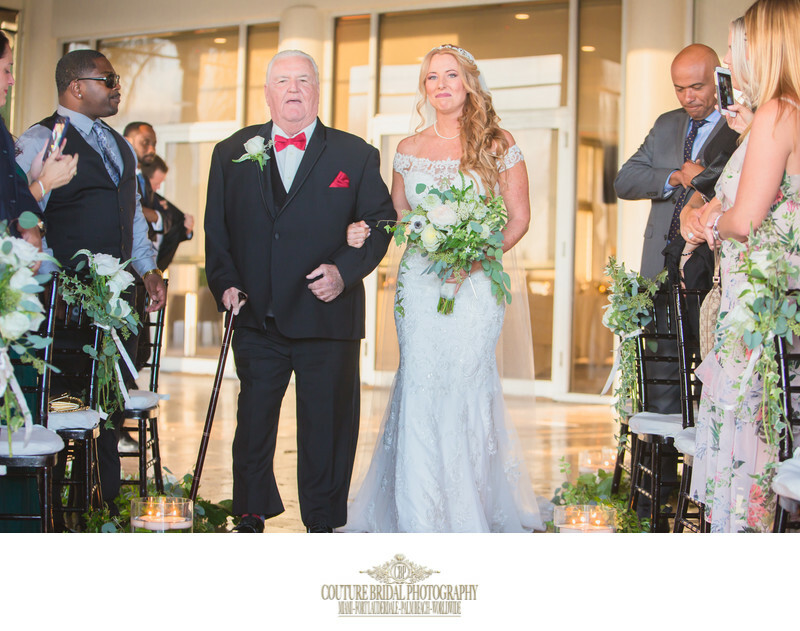 Be certain the bride and groom entrance is separate from other wedding party entrances on your wedding reception timeline, so you can have your own spectacular moment in the spotlight! 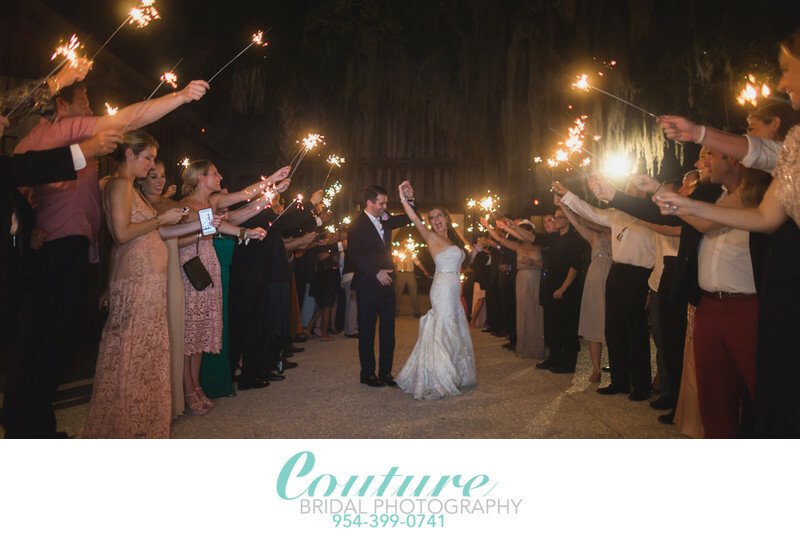 The bride and groom entrance is a great opportunity for us to capture your moment in the spotlight, and is one of the most favorite wedding photos a bride and groom will cherish most! 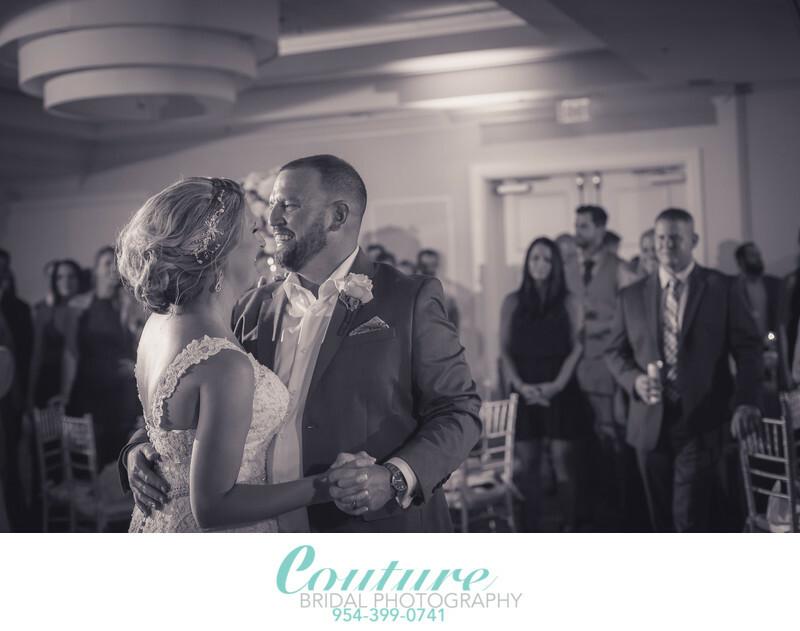 After the bride and grooms grand entrance, all eyes will be on you making this the perfect time for your first dance as a married couple. 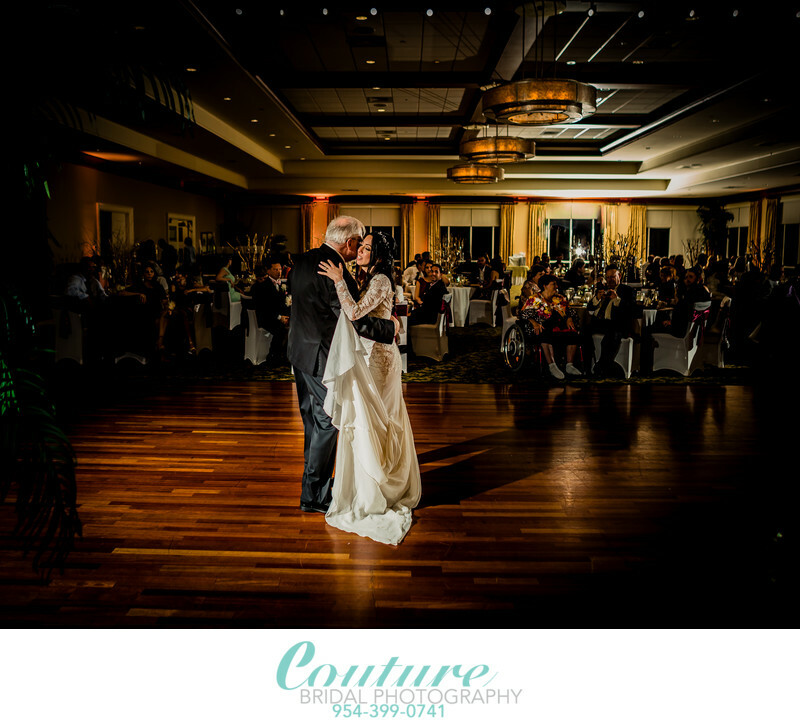 Whether your dance is choreographed or just a slow dance to a sentimental song, this is your moment to shine together as husband and wife. 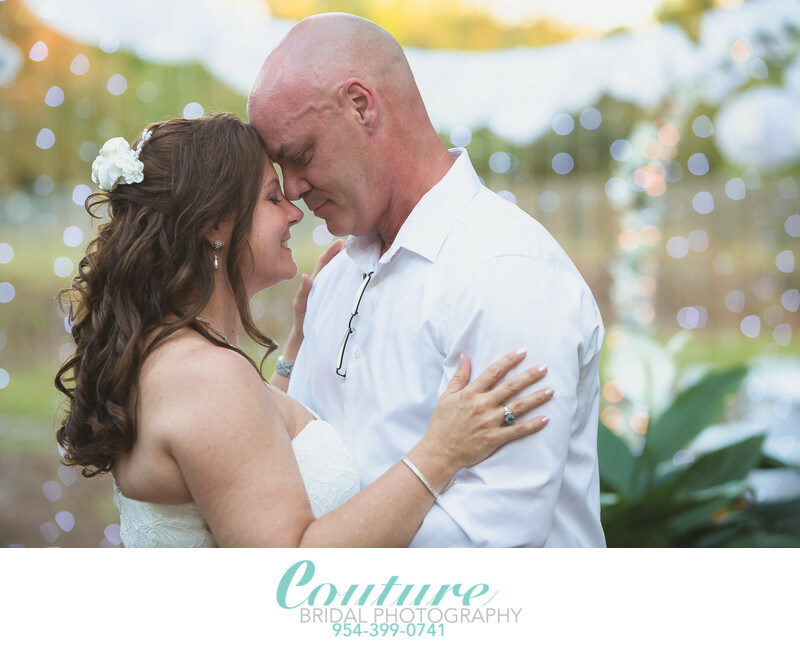 During the first dance, we will be capturing the most intimate moments as you kiss, whisper in each others ears, laugh and cry. 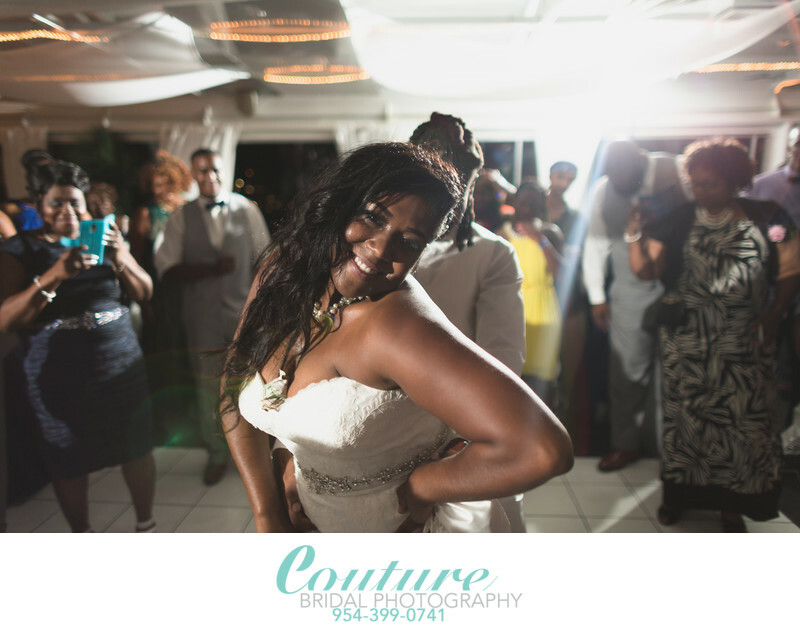 Wedding reception photography is where our photographers get creative with lighting to create the most magical wedding reception pictures you'll love for a lifetime! Now you as a married couple will be seated at your sweet heart table and thank your guests for attending your wedding. Either bride, groom or mother and father of the bride can thank the guest for being there to share this special day with you. In many cases, this is a good time for a blessing from a family member to begin the meal! Be sure you get served first! Make sure you enjoy the wedding meal you selected! Then if you decide, you can go around and greet your guests before returning to your table for the toasts. Unless haven’t set aside a specific time to mingle with your guests elsewhere in your wedding reception timeline. If you decide to take the meal time to greet or take photos with each table, make sure to allow yourself at least 2-3 minutes per table and adjust your meal time accordingly. While your wedding guests are still in their seats completing their meals is the best time to perform the toasts. It’s a good idea to start with the Best Man and Maid of Honor toasts and then follow with anyone else you have asked to toast. If the bride and groom weren't the ones to thank their guests for attending their wedding before the meal. This is the best time to do so. Before the festivities begin! 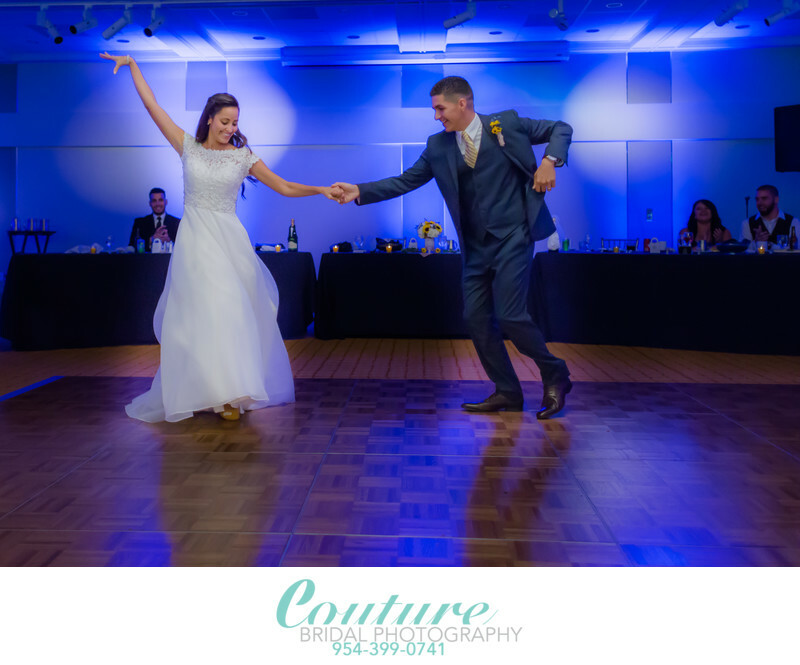 The perfect time in the wedding reception timeline to start the dancing portion of your wedding reception with the mother & groom and father & bride dances in now. After the last family dance, you can have your DJ request all of your guests to get on the dance floor for a group photo. This gets everyone out of their seats and on the dance floor to get the party going once the music starts. Now it’s party time, lets get crazy! 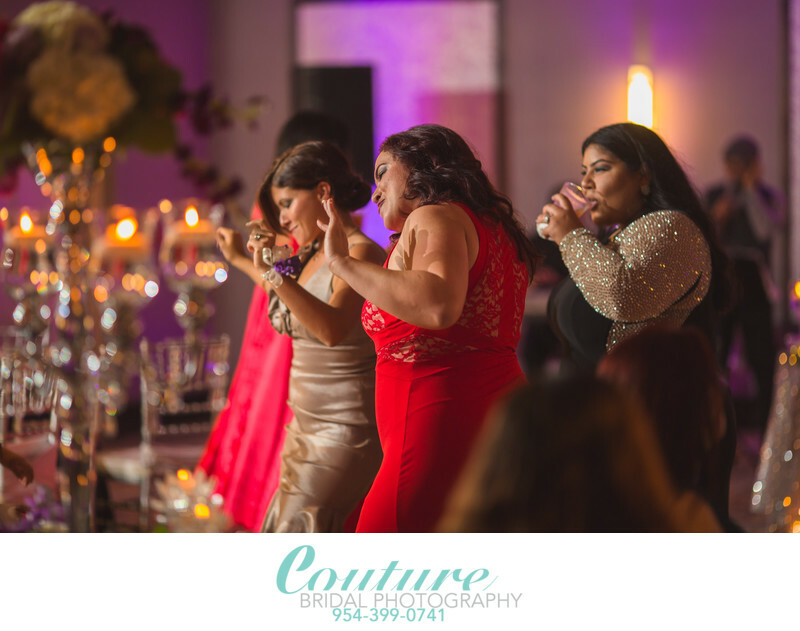 Get the dance floor going with an upbeat song that will get all your guests in the room moving to the beat. In between rounds of high energy songs mixed with some slow songs is a great time to break into your garter and bouquet toss, or any other activities or traditions you have planned in your wedding reception timeline. 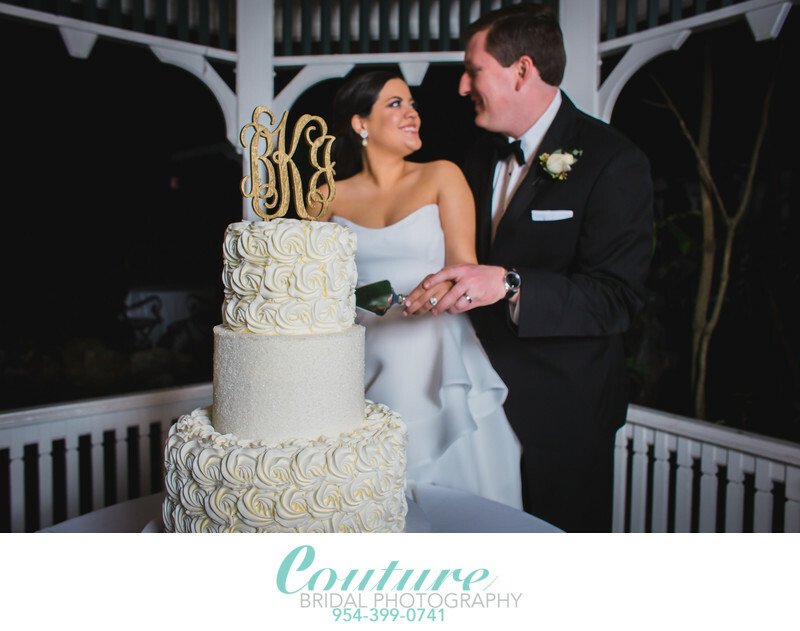 The cake cutting lets guests at your wedding know the party is almost over, and usually done about an hour before your planned grand exit or end to your wedding reception. After the bride and groom cut their piece of cake, have the DJ play some slow to mid-tempo music while your wedding guests enjoy their dessert. During dessert is also a great time to thank all of your guests for coming your wedding and sharing in such a special day! During the last dance set and dessert being served is the perfect opportunity for you to sneak out for a night time couples wedding portrait session. This is a crucial time to schedule on your wedding reception timeline with your wedding photographer. 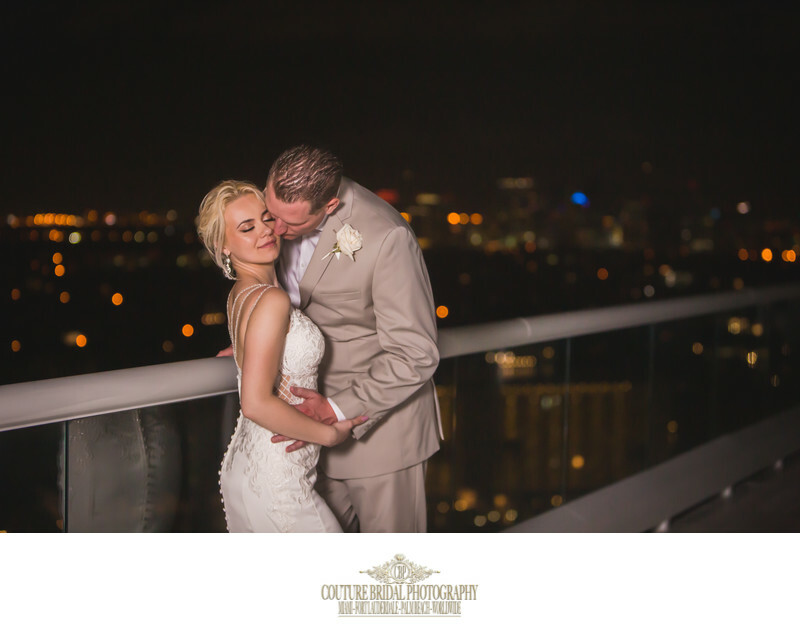 This is when you will get the dramatic and creative night time photos that capture the perfect end to an amazing wedding day celebration. After desserts done and everyone’s feeling a sugar rush, it’s time to get the last wedding dance party going! This last dance will coincide with your night time wedding photo session on your wedding reception timeline. Have your DJ announce when he will be playing the last song, so your guests know its their last opportunity to get out there and dance before wedding celebration ends. Select an upbeat, big hit that is sure to get everyone out on the dance floor to shut down the wedding day celebration! Wedding reception grand exit and get away! At the end to the last set, have your DJ/MC guide everyone outside for your grand exit tor getaway car. It’s honeymoon time… This timeline is up to you!! 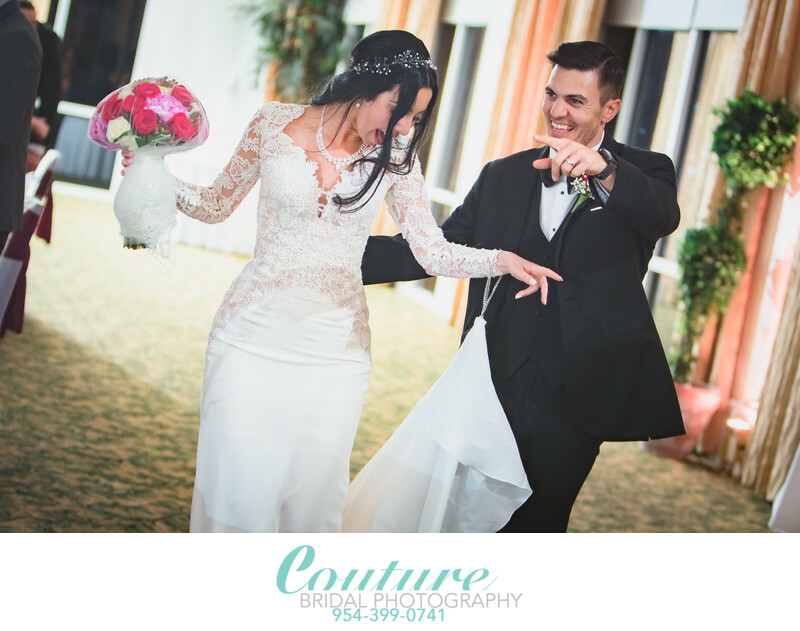 Couture Bridal Photography is South Florida's top rated wedding photography studio offering the most exciting, spectacular and timeless wedding photography. 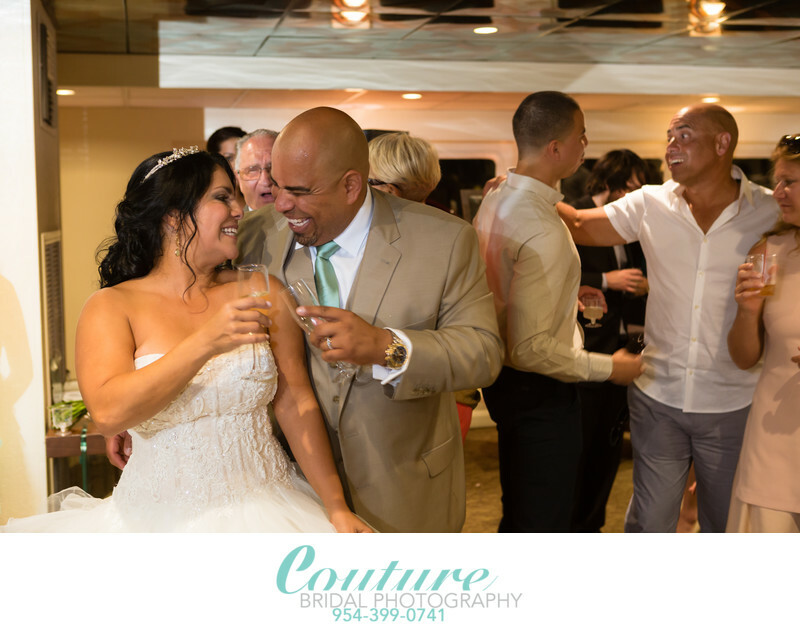 As the best rated wedding photography studio in Fort Lauderdale, Florida we help our brides and grooms with their wedding day and wedding reception timelines. 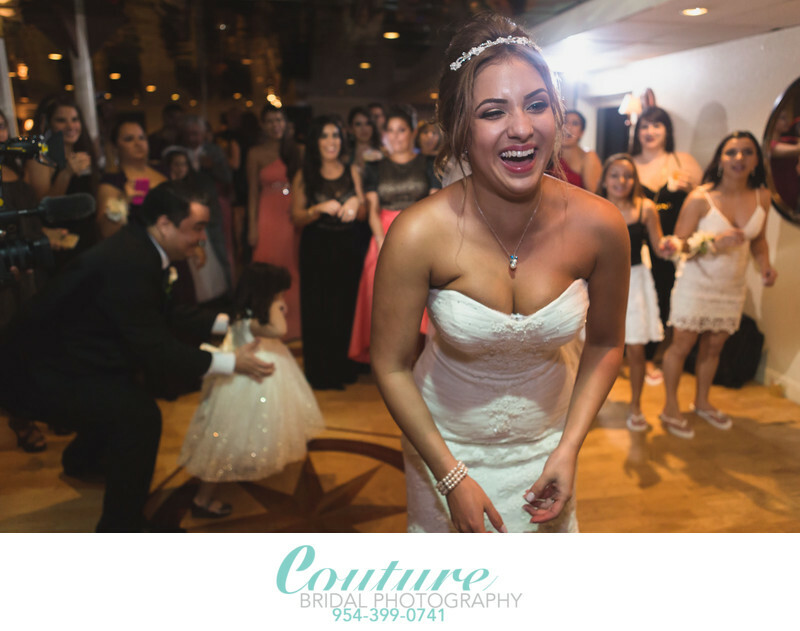 From the party entrances to capturing your wedding guests on the dance floor, we provide you with the best photography of your wedding day. As the preferred wedding photography studio chosen by the bride and groom to document their wedding day, we provide the ultimate wedding day photography experience through to your wedding reception timeline and grand exit. 1/80; f/3.5; ISO 640; 70.0 mm.